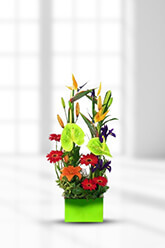 This modern arrangement of glamorous and tropical flowers are creatively arranged to get a maximum 'WOW' factor. Fantastic for the office when you need to make an impact! Lilies may be sent closed/partially closed in order to prevent damage and to last longerFor a lasting impression and the ultimate gesture, we suggest adding a box of superior chocolates to perfectly complement Grandiose. WOW not only are the flowers I ordered beautiful but they were delivered in Brusbsne three hours after I ordered them while in Canada! I saw them the day they delivered & they were beautiful & fresh..... Very happy Thank you ? ?